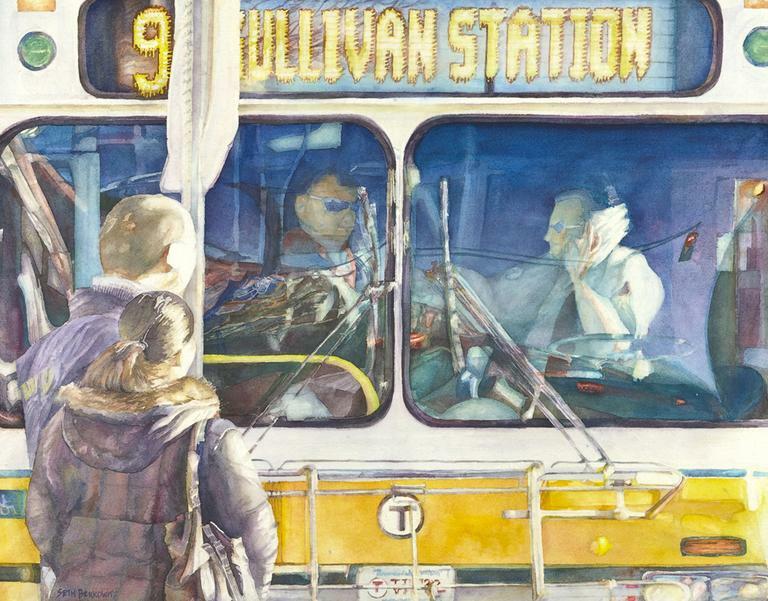 Somerville Open Studios: One Of The Largest In The U.S.
Spring is the height of open studios season in the Boston area. This Saturday and Sunday it's Somerville’s turn to show off its vast creative population’s output. The number of artists per capita in the city is second only to New York City. Somerville Open Studios will be held Saturday, May 4 and Sunday, May 5. A total of 425 artists will share everything from glass blowing to painting to sculpture to photography in 109 different spaces around their city. 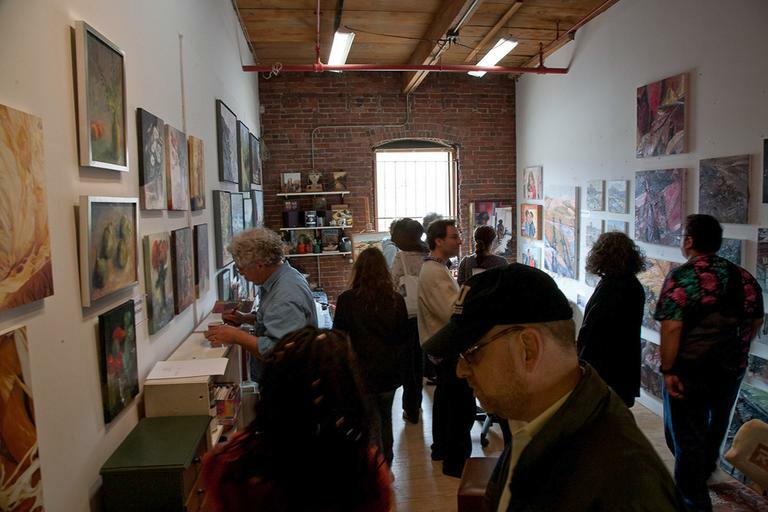 Somerville Open Studios (SOS) is one of the largest weekend-long open studios in the country. "Open Studios is a way to see art in the space where it’s made with the maker present," said Rachel Mello, coordinator for SOS 2013. She describes the open studios concept to people who've never been. 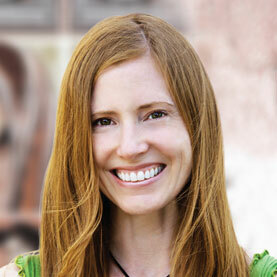 Somerville's is notably robust, but she hesitates to say that it’s the biggest this or that. "Everybody plays little games with definitions, and we are either the largest or the second largest of single weekend open studios," she said, adding that the "single weekend" distinction is critical. "So, in New York — in Brooklyn and Chelsea — you’ll have [open studios] every single weekend or across the whole summer or something like that. Interestingly, the other city with an open studios weekend like this one, on the same scale, is the North East Minneapolis Art Association." Like Minneapolis, Somerville is home to a growing and diverse artistic community. I asked Mello if she’s thought about why that is, and she admitted it's a question she ponders a fair bit. In fact, she consulted with Somerville historians to get some answers. "The short answer is that Somerville has always had since the early 19th century a manufacturing basis — and art is manufacturing. That’s what it comes down to. It’s a different bend on it, but a professional artist is a small business owner, and we are people who make things." In the '60s and '70s large industries moved out, but their industrial buildings remained. Mello said artists did what they often do: They saw potential. "And when other people were saying 'Flee the cities. Go to the suburbs,' artists said, 'Hey, we like Somerville! This is great!' "
It also helped that rents were (and still are) less expensive in Somerville than in neighboring Boston or Cambridge. Converted manufacturing spaces, such as Vernon Street and Joy Street, now house more than 100 artists each. There are mid- and smaller-sized buildings as well, such as Mad Oyster Studios, Artisan’s Asylum and Fringe. 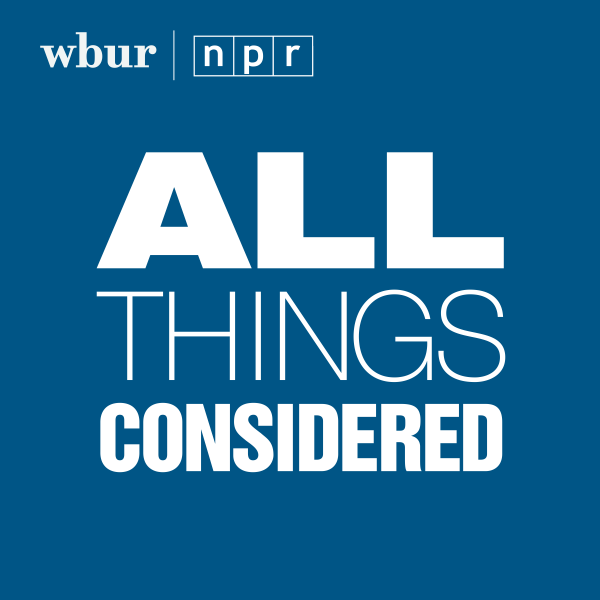 Mello explained that once Somerville became known as an innovative, supportive epicenter for art and artists, more people moved in. But even with that influx, she said the city still manages to maintain its industrial, low-brow identity. "Somerville has always been a little gritty — and with a little luck and careful planning we can still always be a little gritty," she mused with a laugh. People traveling by car can use the four city parking lots for free all weekend. Free trolleys will be shuttling art-seekers between community exhibition spaces and studios. If you live in Somerville, Mello advises you to start with your neighbors — then you can move out from there. 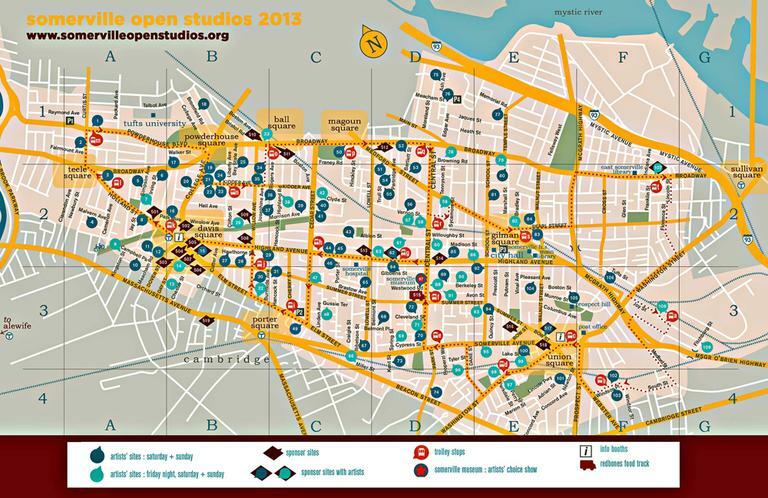 CLICK TO ENLARGE: Somerville Open Studios 2013 map. About one-quarter of the SOS artists work out of their homes, according to Mello, but she said their apartments aren't always ideal spaces for viewing art. "Some of them live on the third floor of a triple-decker, and they might have three toddlers and a Great Dane, so they can't really open that space up to the public." Instead, they're able to show their work at the Armory building on Highland Avenue. The Somerville Museum will also host a sampling of works –- one piece from each of the SOS artists — including digital photographer James Baab. Baab has lived in Somerville since 1999, but only began pursuing photography seriously last year. This is his first time participating in SOS, and he's preparing for guests by rearranging the furniture in his Prospect Hill home. He told me his wife also plans to do some baking. Greeting cards with what Baab calls his "Instagram photos" will be available for purchase, and while he'd certainly be happy to make some sales over the weekend, the artist is more interested in feedback. "I'm not in it for the money at this point," Baab said, adding, "I would like it to be profitable someday, but right now it's mainly about participating and showing that I'm committed to what I've created, and that I'm ready to share not just the product but the passion as well." That's a common sentiment among the SOS artists, according to Mello. She's also a painter and, speaking for herself, she said open studios is about interaction. Seeing art in the space where it's made is very different than experiencing it in a museum or curated gallery show, she said. 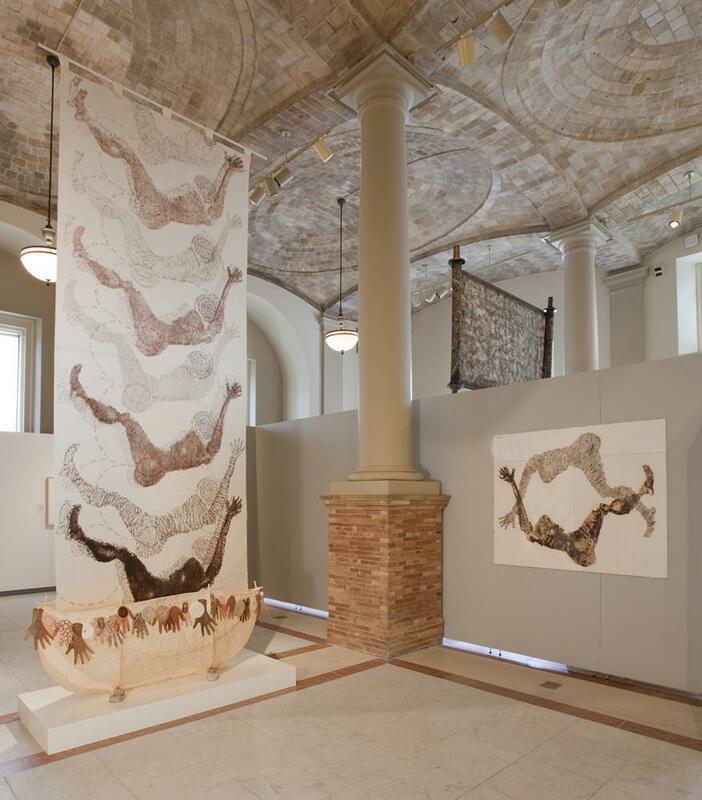 She compared it to "the experience that we as art makers have." "I make a piece of art; I’m making it in my studio; I step back I look at it; I step forward I paint on it; I step back and look at it," Mello continued. "And so when you come into my space and you see my art, you're seeing it in the same kind of space that I saw it in when I made it." There's also the fact that the artist is right there with their work, too. "So you can ask me a question about it," Mello said, admitting she loves that. This program aired on May 3, 2013. The audio for this program is not available.